This website provides content related to investigations into the health of the St. Lucie Estuary. 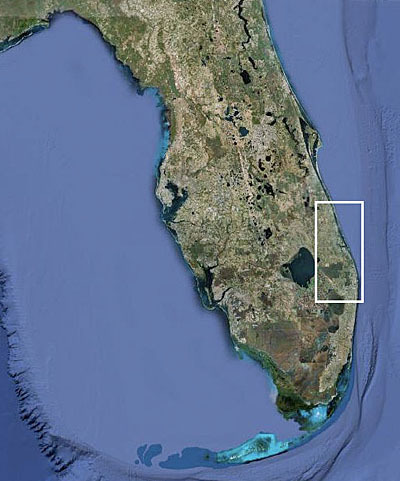 The St. Lucie River is located in Southeast Florida and is fed from freshwater surface input as well as the Atlantic Ocean. This biologically diverse estuarine system is an essential component of the environmental and economic well-being of Martin, St. Lucie, and surrounding counties. The St. Lucie Estuary ecosystem is threatened by increasing residential and commercial development, industry and agriculture, and human negligence. Construction of extensive agricultural and urban drainage projects has substantially expanded the watershed of the St. Lucie Estuary. Effects of these man-made changes have caused significant alterations in the timing (excess wet season flows, insufficient dry season flows), distribution, quality, and volume of freshwater entering the estuary. The estuarine environment of the St. Lucie system is sensitive to freshwater releases, and the South Florida Water Management District indicates that these alterations have placed severe stress on the entire ecosystem. Extreme salinity fluctuations and ever-increasing inflows have contributed to major changes in the structure of the communities within the estuary, as seen by seagrass and oyster losses. The distribution, abundance, and health of the biotic communities within the St. Lucie Estuary system, can be affected, either directly or indirectly, through changes in salinity, toxin transport or release, dissolved oxygen concentrations, nutrient concentrations, food availability, or concentrations of potential pathogens. The health of the fish that live in the St. Lucie can serve as a biotic index to integrate the effects of multiple stressors. Field observations over the past two decades indicates that a small percentage of fishes in the St. Lucie Estuary, and its environs, have deformed bodies. Are these deformities associated with environmental stress? Are they developmental or associated with trauma or disease? This study, through the University of Florida Aquatic Pathobiology Laboratory, reports observations of physical deformities from fish collected through Dr. Joan Browder and the St. Lucie River Team Inititive, 2006-2008. Dr. Browder and her team have been conducting coordinated studies of fish, water and sediments in the St. Lucie River system with support from the South Florida Water Management District and NOAA. Observations of deformities from a subset of frozen archived specimens are presented through this website (refer to "Cases" link in header). Thirty-four fish with deformities were archived frozen and digitally photographed and radiographed to generate observational data. Eleven species of fish, representing 7 taxonomic families, were observed; black margate and pinfish were the two most common species. Deformities primarily included missing or deformed dorsal fin spines or pyterygiophores, with or without concave defects along the dorsal surface. The prevalence of these anomalies in the field-sampled population in the St. Lucie system was approximately 0.18%. These deformities may be developmental/genetic, and/or associated with a variety of other etiologies including trauma, parasites, infection or environmental chemical exposure. There is no direct evidence, however, making such a link at this time. Ongoing studies are focusing on histopathology, as well as examination of water and sediment data to explore relationships between deformities within the different fish species and various environmental stress agents.